SAN JOSE, COSTA RICA – On March 3, 2014, a training seminar on tools for genocide and mass atrocity prevention was held for Costa Rican officials with responsibilities in the areas of human rights and international humanitarian law. 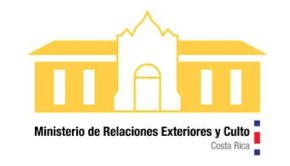 The event was organized by the Ministry of Foreign Affairs of Costa Rica and AIPR, in collaboration with the Office of the Special Advisor on the Prevention of Genocide. The seminar began with opening statements from Ambassador Gioconda Ubeda Rivera, Vice Minister of Foreign Affairs and Saul Weisleder, Deputy Permanent Representative, Permanent Mission of Costa Rica to the United Nations in New York. The importance of anti-discrimination practices and the establishment of early warning systems for atrocity prevention were among the topics discussed in the seminar. This event was held as a national initiative of Costa Rica within the Latin American Network for Genocide and Mass Atrocity Prevention.